There are two lens, one atop the other, that work independent of each other and are completely adjustable. This allows you to set the lens to the perfect focus for each of your eyes. Instant 20/20 is the world's first adaptive eyewear. Instant 20/20 allows you to adjust the lens for near or far sight as needed for each different activity. To get the best results, cover one eye, focus on near or far, and adjust the dial on the temple to the sharpest vision, and you are set. Many people have different power in each eye ( 70% of eyeglass wearers) which is why these have better acuity than readers. 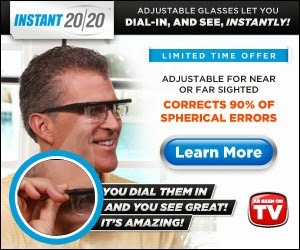 Instant 20/20 is not a prescription eyeglass, however, they correct 90% of spherical errors. When adjusted as directed, Instant 20/20 lets you see. Instant 20/20 does not correct astigmatism.